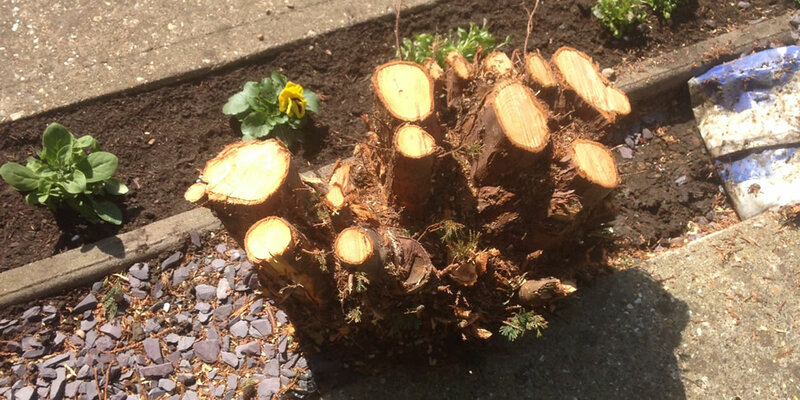 Tree stumps can be unwanted for a number of reasons. They can be in the lawn, flower bed or in the way of a new shed/patio or building. Old stumps can cause honey fungus which lives off dead and decaying wood. This can spread into other trees and shrubs in the garden. Any size stump can be removed using machines that are suitable for the job in hand. 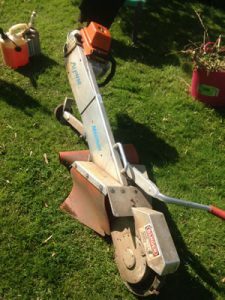 For the majority of the stumps a machine called an Alpine Magnum can be used, which is very portable and can be carried through houses. It can grind any size stump to approximate 18 inches below the surface. For bigger stumps we bring tracked machines would be used. "Thank you for felling and pruning some trees for us and removing several stumps. We were most impressed by a neat and tidy job." "I am writing to thank you very much for the work you carried out on trees in our school grounds. It has made such a difference. Thank you again for such a good job." 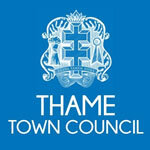 "I would like to thank you for the thoroughly professional way it (the job) was carried out." "Thank you very much for conducting the project so professionally". Seasoned logs are for sale. Woodchip is also for sale as a weed suppressant or in large quantities as biomass for power stations. The majority of by-products from tree work are re-used, making it environmentally friendly.